Simply run a sheet through your printer as you would any sheet. Watch it remove the dirt particles from the internal paper path as it appears on the sheet. At 8.5 x 11 inches it will clear away dust, paper & dirt particles as well as excess toner resulting in crisp copies and trouble-free operation. Eliminates service calls when used regularly. Recommended use is once a week on an average printer. 25 sheets per package. Reusable up to 20 times. Removes dust and dirt particles meticulously from areas where they accumulate. 25 sheets per package. Use each sheet up to 20 times. 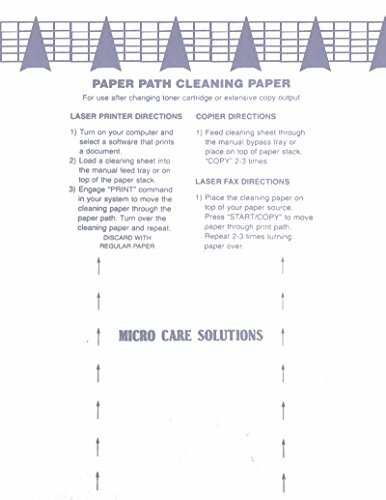 Eliminates paper jams and feed issues by contacting each part of the paper path. Use once a week for general average use printers to eliminate service calls. If you have any questions about this product by Microcare, contact us by completing and submitting the form below. If you are looking for a specif part number, please include it with your message.